Marilyn Houlberg passed on June 30th 2012. Bless you Marilyn! She was a hero for Haiti, a gift from the Spirits. She schlepped cases of canned tuna to Haiti and she brought them sequins and beads, doll heads and whatever else they asked for. She stood in the Visa line at the embassy in PaP- with the Gran Rue artists for days on end, to be sure they got visas. But most of all for over 40 yerars she bought stuff from artists of all kinds: painters, sculptors and Flag artists and disseminated it around the world. She was an acclaimed expert in African religions and Haitian Vodou. She lectured on the subject frequently, always promoting Haiti. 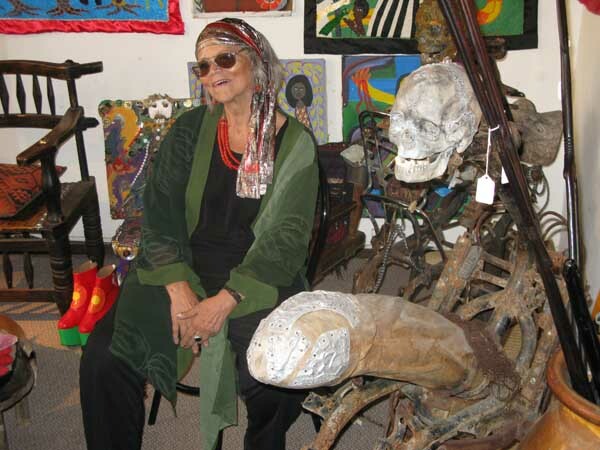 I had the pleasure to spend a day with her in September 2007 at the show "Vodou Riche" in Chicago. After 15 minutes I was in love with her for life. After the show we went back to her pad with Eugene, Celeur and Guyodo and had a few beers and listened to music. Neysa-Page Lieberman came later. It was a magical day. If anyone has details on her passing or knowledge of her collection, please share it.